On 8 September1789 the two-decked fifth-rate Guardian 44 set sail from Spithead armed en-flute and commanded by Lieutenant Edward Riou. Aboard were a collection of stores, machinery, livestock and, plants, in addition to thirty-six civilians and convicts, all of whom were bound for the new settlement of Port Jackson in New South Wales. The ship’s crew numbered eighty-eight men, not one of whom, apart from Riou, was a commissioned officer. The Guardian was a relatively new ship, having been launched on 23 March 1784 at Limehouse, but then placed in Ordinary for the next five years until commissioned at Deptford for the first time by Lieutenant Riou. In July 1789 she had sailed from the Long Reach for Spithead to undertake her provisioning and crewing prior to her voyage to the far side of the world. Her 26 year-old commander, the son of a humble captain of the Guards, had sailed as a midshipman under Captain James Cook during his third voyage of exploration to the Pacific, and had also seen employment on the Newfoundland station. He was a popular officer, not least because he was skilled in his trade, had a strong intellect, and was a sensible and consistent man-manager with a keen sense of duty and a strong, if understated, conviction in God and in his own abilities. Having arrived at Tenerife on 26 September the Guardian made a fair passage south through the Atlantic and reached the Cape on 24 November. Here three of the men took the opportunity to desert and two were sent home sick, being replaced by two volunteers from ships at the Dutch colony. With her provisions and stores replenished despite some difficulties with the local authorities, the Guardian finally set off into the Indian Ocean on 11 December where she dropped down to the southern seas in order to pick up the more favourable winds. On 24 December in calm, freezing conditions, an iceberg was sighted at a position some fifteen hundred south east of the Cape, and upon closing with it Riou sent two boats away to take on fresh water for his men, plants and livestock. These boats returned only as the day was drawing to a close. Once the boats had been secured the Guardian sailed cautiously off into the dark, icy, foggy night with lookouts stationed all around the ship to ensure that she maintained her distance from the iceberg. But shortly before nine o’clock the mists parted and she found herself before, and indeed beneath, a giant ice mountain, which was perhaps twice as high as her own mainmast. In attempting to avoid it the helm was thrown over, alerting Riou who threw his cup of tea aside and raced on to the deck. But it was too late – the ship grounded on a spar of ice beneath the water, a gust of wind spun her on her heel, and she was thrust stern-wards towards a huge cavern in the iceberg. Above the Guardian a huge tentacle of ice threatened to plunge down through her deck, but although she was suddenly thrown loose it was without her rudder, and with a gaping hole in her hull. Frantically the men took to the pumps, but despite their efforts there was six feet of water in her hold before midnight, and the Guardian sunk ever deeper throughout the early hours. Animals were herded on deck and thrown overboard. The cannon were eased over the side. In the morning a fothered sail was passed beneath the hull to stop the leak, but this had to be replaced time and again as the raging seas tore it loose. Throughout Christmas Day the men toiled at the pumps and jettisoned the remaining cargo to no avail, and soon the water in the hold had reached a level of seven feet. To compound matters Riou was injured when his hand was crushed between a couple of casks whilst leading a work party below decks. Next morning, with the water lapping onto the orlop deck and the ship rolling helplessly in a gale, members of the crew and convicts came aft and demanded to be allowed to take to the boats, believing it to be their best hope of avoiding a watery grave. After a further hour’s fruitless pumping Riou gave his permission, but as there was not room in the five boats to accommodate all of his men he announced that he intended to remain aboard and take his chance with the ship. By this time many of the crew had broken into the liquor store and drunk themselves insensible, and in the mad scramble that followed Riou’s agreement one of the jolly boats capsized before she was barely in the water with the loss of two seamen and the surgeon. Eventually the other boats were hoisted overboard and manned, but when twenty or so panic-stricken and intoxicated men attempted to leap into one of the cutters after it came back alongside with a demand for a new sail, the boat’s crew frantically bore away once more. Then as the boats began to battle their way into the bleak distance the second jolly boat sunk. Eventually only the launch, containing the master, purser, chaplain, gunner, a master’s mate, a midshipman and nine seamen, would reach safety. Whilst all the confusion, scuffling and panic-stricken grabbing of provisions had been going on Riou had sat on his heaving, soaking deck and penned a letter to the Admiralty which he gave to Mr Clements, the sailing master who was commanding the launch. In recommending his mother and sister to the public favour he made it clear that he considered the end to be nigh for him and those who remained with him, these being the boatswain, the carpenter, three midshipmen and a further twenty-six seamen, together with nine free passengers including a daughter of a superintendent of convicts, and twenty-one convicts. On Saturday 26 December the foresail was placed over the bows and secured, whereupon the men returned to the pumps. Surprisingly, although the Guardian’s stern was stove in and there was a hole beneath her bows, they began to gain on the leak. It was soon established that the casks down in the hold were pushing up against the lower deck, and with the hatchways being battened down and caulked, and with the ballast sliding out through the hole in the bows, the Guardian had obtained the, albeit precarious, properties of a raft. Such was Riou’s confidence that his men could keep the ship afloat that when two horses were found after the rest had been thrown overboard on Christmas Eve he consented to let them remain on the ship. Meanwhile he tried all sorts of inventions and ideas to give his vessel steerage, but in reality he could do little more than keep her head to the north and manipulate the sails to do the rudder’s work. Over the next nine weeks the relentless Riou kept the men at the pumps, and when their strength or resolve gave way he drove them back to their work through his force of personality, and quite regularly his use of personal force, be it a fist or a cocked pistol. Even the young daughter of the superintendent of convicts was not spared, and for many long cold nights she found herself wading through the freezing waters below deck to deliver ale and rum to the shattered men. With her scuppers often below the level of the water the fact that the Guardian remained afloat was still nevertheless nothing short of a miracle, and as the days of January passed by it appeared likely that she would not only survive, but would eventually make landfall on the southern coast of Madagascar. By early February her course had veered further around and she appeared set for a landfall on the southern coast of Africa. This in itself was not entirely good news, for at the time memories of the loss of the East Indiaman Grosvenor on the coast of Caffraria seven years before, and the resulting tribulations of her unfortunate passengers and crew, were very fresh in their minds. Thus it was with a huge relief that on 21 February the Guardian came in sight of the Cape itself. Riou and his men had truly pulled off an amazing feat. As soon as the shattered remains of the Guardian were seen a whale boat and half a dozen fishing boats went out to tow her in, and she was moored with a borrowed anchor in Table Bay. The arrival of Riou and his men, garbed in such filthy rags, and with such long beards and hair that it was impossible to tell the convicts form the mariners, was to the amazement of all, for the launch had already reached the Dutch colony with news of the Guardian’s likely demise, having had the staggering good fortune to be picked up by an off-course French merchantman on 3 January, some two hundred and fifty miles east of Cape Natal. Somewhat ironically, among the first people to come aboard and offer help with repairs to the Guardian were John Fryer and William Purcell, respectively the master and carpenter from the Bounty, who were homeward bound having themselves so recently survived an epic open boat voyage. 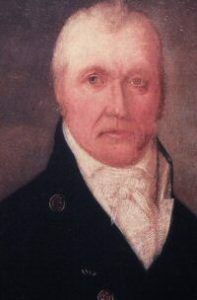 John Fryer, ex-master of the Bounty, who was at the Cape when the Guardian came in and declared her unfit for further service. Shortly afterwards the Guardian was taken around to False Bay, and Fryer and Purcell gave their official opinion that due to her extensive damage she could not be repaired. After a violent storm on 12 April Riou had her beached so that every last item of value could be removed. He then spent his time arranging transportation of her stores, some of which were desperately required in New South Wales, and which he was able to forward in a hired vessel, and with the outward-bound convict ship Lady Juliana, which arrived at the Cape in June. This disbursement kept him fully occupied for many months, so that to his great disappointment he was unable to join an expedition that set out in August to search for any possible survivors from the earlier wreck of the Grosvenor. In England, the news of the Guardian’s certain loss was reported to the Admiralty on 23 April upon the arrival of the East Indiaman Middlesex off Falmouth. But these grim tidings were dramatically countered just four days later when a Dutch packet hailed a fishing boat in the Channel and handed over a letter from Riou that had been composed in Table Bay on 22 February. Once this report of the Guardian’s miraculous survival became general Riou’s stock soared, with the King and Lord Howe singing his praises. The first lord of the Admiralty, the Earl of Chatham, whose fourteen year-old nephew, Hon. Thomas Pitt, had remained aboard the Guardian, announced that he would promote Riou before rushing off in a chaise and four for Cornwall to inform his cousin of the boy’s survival. 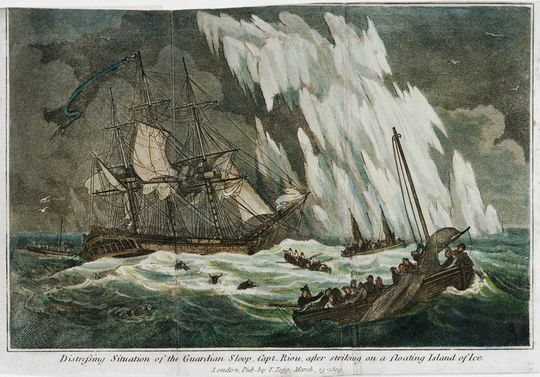 No less a personage than Rear-Admiral Lord Hood carried the happy tidings to Riou’s mother, whilst engravers and illustrators across the land began producing works depicting the horrific encounter with the iceberg and the heroic voyage of survival. 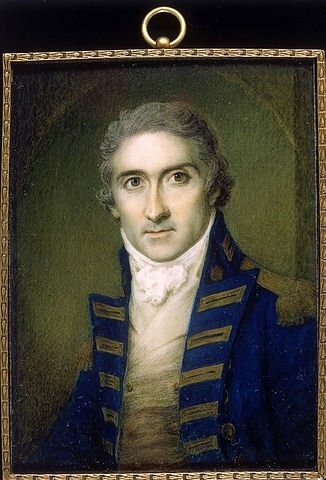 Riou eventually arrived home in mid-May 1791 with other members of his crew aboard the Sphinx 20, Captain George Tripp, and after attending Vice-Admiral Robert Roddam, the port admiral at Portsmouth, he set out early the next morning for London. Following an interview with the lords of the Admiralty and the formality of the court-martial into the loss of the Guardian his promotion to commander was confirmed, and having been presented to the King he was posted captain on 4 June. Sadly the gallant Riou was to lose his life ten years later at the Battle of Copenhagen before his immense talents could be fully utilised. An unhappy fate also awaited Pitt’s nephew, who inherited the title of Lord Camelford on his father’s death in June 1793, and was promoted commander in 1797. Being something of a hot-headed rake, he earned notoriety for taking a cane to Captain George Vancouver in 1796, and then shooting dead a ‘mutinous’ fellow officer in cold blood two years later. It was therefore of little surprise when he was killed in a duel in London in 1804. Meanwhile redemption was granted to the twenty convicts whom Riou had managed to keep at the pumps by the promise that he would seek a free pardon for them. True to his word he managed to get their sentences commuted on the basis that they would remain as free men in New South Wales for the duration of their original term of punishment.